Height adjustment screws, springs and wiring diagrams included. Mounting rings and mounting ring screws are available separately. Handy Humbucker Helpers make installation easy. Making new pickups look old: Brand new pickups looked too shiny in this guitar that had seen a lot of gigs. So Dan Erlewine opened the old pickup and put its cover on the new one. This meant cutting the solder joint and resoldering. Erick Coleman shows how he modified a Parsons Street Humbucker, turning it into a switchable single-coil/humbucker combination. Wiring diagrams and color codes for Golden Age Parsons Street Humbucking pickups. These pups well exceeded my expectations. They have a killer vintage tones. I have a 85 Gibson LP standard that I was trying to get that vintage tone from. I tried some SD vintage blues 59s but wasn't happy with the tone. After popping these babies in I got what I was looking for. I thinking about a second set for an Epiphone next. Best pickups aftermarket I ever bought. I bought this pickup to go with a golden age humbucker, but watch out the pickups are not in phase with each other. but once they are they sound great together. My tone quest is over! I bought an Epiphone ES Les Paul Pro and it sounded great acoustically but the Pro buckers despite the positive reviews were too muddy for me. Single coil at the neck and on humbucker at the bridge reduced the boom at the bottom end but still lacked string definition. I removed all the electronics and replaced them with the Stew Mac Les Paul vintage wiring kit and a golden age Parson street Alnico 5 at the neck and an alnico 2 at the bridge. The wiring kit diagram that was included was useless but the diagram that came in the pickup tubes is exactly how I wired it up. After I ordered these pickups I looked at all the armature YouTube videos showcasing parson street pickups and thought … oh dear, I might have wasted my money. These are truly dreadful representations for the most part. I plugged the converted Epiphone into my deluxe reverb and Oh my gosh….. The Holy Grail. My tone quest is over! Great tone and string definition. So clear that by times they sound like single coils without hum. What do I do with my shelf full of boutique pickups now? I was very surprised by this pickup. Great tone and brightness. Great price point too. Normally I don't write reviews but Stew-Mac has amazed me with two different pickup swaps, first the Golden Age P90s for my Epiphone '56 Reissue, and more recently I put a set of these Alnico 2s in my Epi '06 Standard. The swap was more a curiosity, nothing really bad to say about the stocks but they were on sale and I had a coupon. Installation was a breeze and the difference were pretty staggering, better noise cancellation, a little brighter sounding and all together more volume. Wish I had more projects to do, definitely curious to see what everything else sounds like. I purchased these after reviewing Eric Coleman's video. I've found his videos and reviews to be very reliable. If he told me to jump off a bridge, I'd do it. Great choice for a more vintage tone. Excellent quality, perfect in appearance, quality of materials and great tone. The Alnico 2 set I bought were a bit darker in tone than I expected but a great sounding pickup nonetheless. I would definitely recommend them. I for one was never really interested in humbuckers though my dad's old Les Paul was equipped with them. He wanted to get a new bridge humbucker so I decided to look to Stewart MacDonald because I have not ever been disappointed with the products and the service. I bought him the Parsons Street Alnico 2 Humbucker by Golden Age and I am literally blown away. These are the best, nothing funky or razzmatazz, and for the price, that pickup is still holding strong and better than most other humbuckers I've heard on the market. Now my dad has that authentic sound like Mike Bloomfield and Eric Clapton. I can't wait until I try out the P-90's and Strat pickups for my guitars. Thank you so much for this awesome product, I definitely suggest these to anybody. 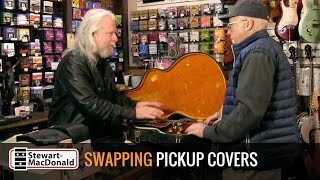 Great way to upgrade your pickups for the money. I put a pair of these pickups in a Custom Tele. I put in a Alnico 2 in the bridge and Alnico 5 in the neck positions. The Alnico 2 in the bridge paired with the 5 in the bridge position give it a great balanced tone that I was looking for. I would highly recommend these and they won't break the bank.